You can create items via email by emailing the address defined in your preferences. The email address will be in the form pages-<username>-<drop-box password>@teamworklive.com (i.e. pages-susan-lee@teamworklive.com). The drop-box password allows us to make sure that it is actually you who is sending the email. Can I create items by entering the drop-box address into the CC or BCC field of my email program?Can I create items by entering the drop-box address into the CC or BCC field of my email program? Can I create items by entering the drop-box address into the CC or BCC field of my email program? Yes, you can create an item via email by entering the drop-box address into either the CC or BCC field. Send the email to the address defined in your preferences. The title of your email will become the title of the new item. You can specify the project, whether the item is a milestone or task, the responsible person, etc. in the subject too (see below). The files attached to the email will automatically be attached to the new item. If you attach multiple files, additional files after the first will be attached as related items. There is a 50MB limit on the total size of the attachments. The body of your email will become the body of the new item. You can configure the item you are creating by adding keywords to the subject line. Be sure to the include the brackets when specifying the keywords. Put the project's name in the subject line. For example, to put the item in the "Thoughtful Solution" workspace, put [thoughtful solution] in the subject line. If you do not have any other projects that start with "thoughtful", you can simply put [thoughtful] in the subject line. Put the folder's name in the subject line in brackets. For example, to put the item in the "Marketing Research" folder, put [marketing research] in the subject line. The case does not matter but it's important that you use the complete name of the folder. Be sure to specify the project workspace too (see above) if you are putting the item in a project folder. Put [milestone] in the subject line. Put [task] in the subject line. Put the milestone's name in the subject line. For example, to assign a task to the "Phase One" milestone, put [phase one] in the subject line. The case does not matter but it's important that you use the complete name of the milestone. Put the responsible person's first and last name or email address in the subject line in brackets. For example, to assign the task to Jeff Clark, put [jeff clark] or [jclark@collectivesoft.com] in the subject line. There are many different ways to add the due date for a milestone or task. [today] - Due date is set to the current day. [tomorrow] - Due date is set to the next day. [sunday] - Due date is set to the next Sunday. [monday] - Due date is set to the next Monday. [tuesday] - Due date is set to the next Tuesday. [wednesday] - Due date is set to the next Wednesday. [thursday] - Due date is set to the next Thursday. [friday] - Due date is set to the next Friday. [saturday] - Due date is set to the next Saturday. [next week] - Due date is set to a week from the current day. [next month] - Due date is set to a month from the current day. [next year] - Due date is set to a year from the current day. The reports date format specified in your preferences: [09/29/77],[29/09/77], [77/09/29] - September 29, 1977. The month and the day: [September 29], [Sep 29] - September 29 of the current year. The month, day, and year: [September 29, 2006], [Sep 29, 2006], [Sep 29, 06] - September 29, 2006. Put the time in the subject line in brackets. Examples of valid times include [4:30am], [16:30], and [4am]. 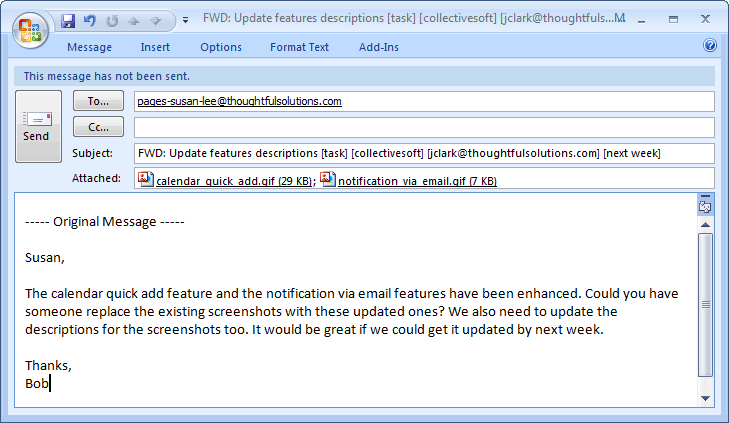 In the example shown in the screenshot, an email with the subject line "Update features description [task][collectivesoft][jclark@collectivesoft.com][next week]" will create a task called "Update features description" in the "CollectiveSoft" workspace. The task will be assigned to the project member with the email address jclark@thoughfulsolutions.com and will have a due date of next week. An alternative to specifying the keywords in the subject line is to incorporate it into the email address. This method has an added benefit in that you can save the email address to your address book (for frequently used keyword combinations) and reduce the amount of keywords needed in the subject line. The customized email address alternative has some limitations in that email addresses can only have letters, numbers, and dashes. As a result, some options can only be specified in the subject line (such as the person assigned to the task). You will also need to replace spaces in keywords with dashes, so if the project's name is Thoughtful Solutions, you would need to change it to thoughtful-solutions before inserting it into the email address. You need to replace the slashes with dashes for dates and leave out the colon for times. Be sure to test out each of your customized email address with a couple of test emails to ensure that they are being processed as intended. To customize the email address for the example above, you would change pages-susan-lee@teamworklive.com to pages-susan-lee.task.collectivesoft@teamworklive.com and put "Update features description [jclark@collectivesoft.com][next week]" in the subject line.